The winter doldrums not only affect us, but our pets as well. Here’s something to pe-r-r-k up your favorite feline fur friend. 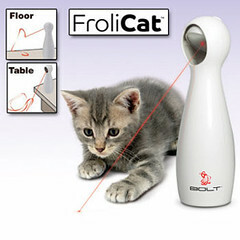 The FroliCat Bolt™ Automatic Laser is an interactive laser toy that provides hours of fun for you & your pet. Simply hold BOLT in your hand or place it on a flat surface, turn it on, & watch your cat pounce, chase, & bat at the exciting laser patterns. Needs 4 AA batteries (not included). 4.1 paws out of 5 approval review. Under $20.00 available online at Amazon, best price Petco® $17.97. Calling all dog lovers, Rachael Ray now brings “yummo” to our pets with Nutrish™ Premium Dog Food. Join her and her furkid, Isaboo, in a tasty treat for free. 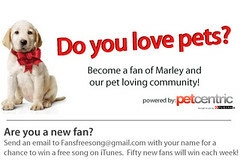 If your pet really enjoys it, you’ve found a new reward treat! Supplies are limited, so don’t woof around, sign up for your “free” sample! Is Christmas Going To The Dogs–or Cats? Yes! Pets are wonderful and are a source of unconditional love and companionship. When our day hasn’t been great, they are waiting at the door to welcome us home and are always glad to see us. Whether wagging their tail, rubbing against us; greeting us with a friendly yap! or purr; or planting us with a sloppy kiss and wet nose, they just make you feel better. Our fur kids are part of the family, and as part of the family now you can download their pictures and send a customized or generic Critter Carol from Purina® sponsored Petcentric for FREE! Nothing says the holiday like a Deck The Halls Woof! Petcentric is a great site to connect with others who love animals with stories, photos, products, and more. Don’t have a pet? Well, send a critter e-card to a friend or family member who does own a pet, or just for the heck of it to brighten a co-worker’s day, send one to them! Or just visit the site for a quick uplift, you will be glad you did!